Sylvain Touati, from the French Institute for International Relations is interviewed on Al Jazeera. Second, coup leader Captain Amadou Sanogo really must step aside. Not only did he topple a democratically elected leader (which was wrong irrespective of corruption concerns at the time), his presence as the real power behind the sham interim government necessarily limits broad international support for external assistance in this difficult time. Related to Sanogo’s departure must be a clear plan for creating a legitimate interim government in Bamako. Third, an unambiguous plan for a peace process in the North must be developed which includes armed UN peace keepers across the major urban centres of the provinces of Gao, Timbuktu and Kidal and a referendum on the future status of this region. While the rebels would almost certainly lose such an election if it were well-monitored, the process itself would be important for moving forward on a path to peace and reconciliation. The real question is, who is ready and willing to take the risks to implement these measures? The African Union has been remarkably quiet since the beginning of the crisis, and I would be surprised if the organisation takes (necessary) concrete steps to get involved in the political and military transition in Mali. France, on the other hand, will have to deal with increased risks if it goes beyond the mission of fighting rebel troops in Northern Mali. Active involvement in Mali internal politic and military issues looks like a big gamble, considering the French stakes in the country. What solution for the Malian crisis? Only two outcomes, together, can prevent the nightmare scenario of a huge failed state in the heart of Africa spreading violence across the continent. First, the French-led assault on the north must manage to force most of the Salafi fighters out of the populated areas presently under their control and install a viable African-led security force that can hold the population centres for several years. If that weren’t difficult enough, French and international diplomats must create space for the establishment of a much more representative and less corrupt Malian government, one which can and will negotiate an equitable resolution to the decades long conflict with the Touareg peoples of the North, whose latest attempt violently to carve out a quasi-independent zone in the north early last year helped create the political and security vacuum so expertly, if ruthlessly, exploited by al-Qaeda in the Islamic Maghrib (AQIM) and its allied radical groups. […] The international community insisted that what Côte d’Ivoire required to end its crisis was to hold democratic elections, even though the conditions did not exist to conduct such elections. Though they knew that this proposition was fundamentally wrong, the Ivorians could not withstand the international pressure to hold the elections. However, the objective reality is that the Ivorian presidential elections should not have been held when they were held. It was perfectly foreseeable that they would further entrench the very conflict it was suggested they would end. […] In protracted negotiations from 2002, the Ivorians agreed that the presidential elections would not be held until various conditions had been met. These included the reunification of the country, the restoration of the national administration to all parts of the Ivorian territory, and the disarmament of the rebels and all militia and their integration in the national security machinery, with the latter process completed at least two months ahead of any presidential elections. Despite the fact that none of this was honoured, the presidential elections were allowed to proceed. […] At the end of it all, there are many casualties. One of these is the African Union. The tragic events in Côte d’Ivoire have confirmed the marginalization of the union in its ability to resolve the most important African challenges. I highly recommend this article, even if the reasoning of the ANC member has too many flaws. In short, Thabo Mbeki, former South African President, blasts the “International Community“, France, the United Nations, and the Ivorian opposition not only for the outcome of the crisis, but for organizing the elections in the first place. According to Mbeki, the conditions required in order to have free and fair elections were not met in October 2010. The military situation, the foreign relations, the social and political context should have delayed the decision to hold the elections. No-one can really disagree with the merits of his arguments. The conditions in 2010 were not optimal to hold free and fair elections. But the problem of his thesis is the victim role he gives to Gbagbo from the start. He seems to forget that Laurent Gbagbo was the most powerful man in the country for more than ten years. He controlled the economic resources, the media, and the powerful FANCI and militias. 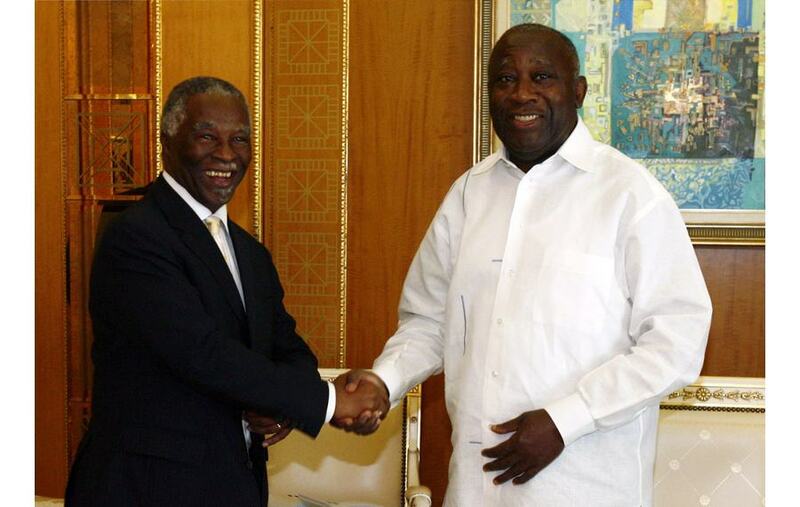 It is only very recently that Gbagbo lost his upper hand and did not control the situation. He led the country for ten years (his five-year term and another five years during which he delayed the elections). Ten years during which the situation for Ivorians got worse everyday. Partly because of the 2002 rebellion, but also because of the gross mismanagement of every single aspect of society. Laurent Gbagbo is responsible for not committing enough resources and energy to setup the right conditions for these elections. He never proved himself capable of handling the military, social and political crisis in the country. For ten years, his only successful policies were aimed at state survival. Further more, all the contestants suffered from the bad conditions that Mbeki enumerates. Because he controlled the state-media and the economic capital Abidjan, Gbagbo even had an advantage compared to the Parti Démocratique de Côte d’Ivoire or the Rassemblement Des Républicains. The 2010 elections were long overdue, and the outcome would not have been different in another context. It was a failure for South Africa’s foreign relations, and for the African Union that South Africa tried to take the leadership of. Hopefully, it will create better conditions for preventing similar scenarios elsewhere in Africa.